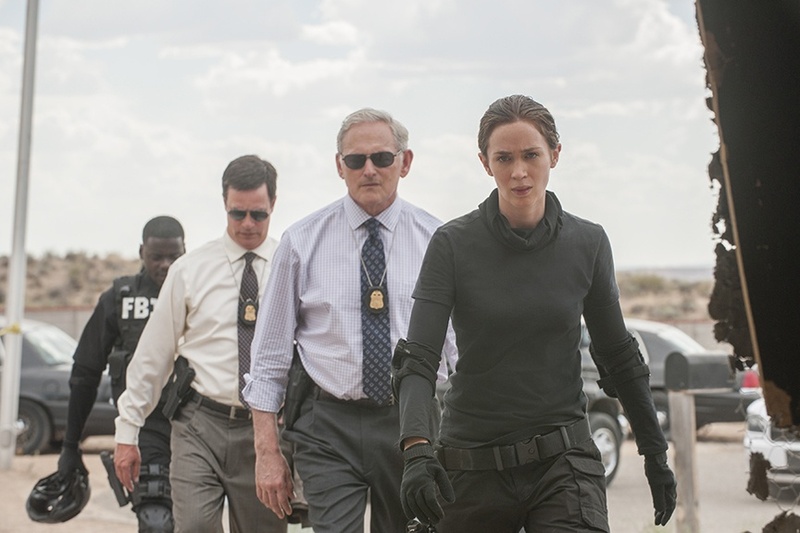 Emily Blunt, Victor Garber, Benicio Del Toro and Josh Brolin star in Sicario. Photo Credit: Lionsgate. The film, Sicario, named after the assassins who work for drug cartels (‘hit-man’ in Spanish), is an action-thriller set on the U.S.-Mexican border that deals with the fight against the Mexican cartels. Although several TV series have concentrated on this theme as of late (“Narcos,” “Breaking Bad,” “The Bridge”), director Denis Villineuve (Prisoners, 2013) manages to combine this subject matter with his own dark, foreboding style that makes the film stand out among similar premises all while depicting the ruthlessness that the war on drugs has succumbed to. The film centers on Kate Macer, an idealistic FBI Special Weapons and Tactics Team member played by the well-cast Emily Blunt (Into the Woods, 2014), who opens the film by leading a SWAT team raid into a drug house, or what they call the ‘house of horrors’ in the suburbs of Phoenix. The sequence starts with pounding heart-beats in the background while a slew of packed police vehicles rush in and unload – assault rifles in hand. After an intense shootout with drug dealers, Macer’s team disturbingly finds dozens of corpses lining the walls. While searching for more bodies, they end up setting off explosives in a booby trap that only increases the body count. Macer describes her account of the jarring events to her superiors including Matt Graver (Josh Brolin, Inherent Vice, 2014), a member of CIA Special Activities Division. Graver is impressed with Kate’s experience in the field and presents her with the opportunity to join his task force and hunt the people who were ultimately responsible for the violence. Macer quickly agrees to join their team and flies to an army base in El Paso, where a team of U.S. marshals, soldiers, and a mysterious consultant, Alejandro Gillick (Benicio Del Toro, Inherent Vice), are briefed by Graver. Although Kate is uncertain of the mission’s objectives and Alejandro’s affiliation, she goes along for the ride and soon finds herself on a dangerous mission into Juárez, Mexico to extract a prisoner who can help them get to the cartel heads. To give you an idea of just how dangerous Juárez is, when President William Taft first visited Mexico to meet with the President of Mexico he took 4,000 troops with him. The scenes of Mercer and team entering Juárez are extreme and jaw dropping at times. Much of this sequence was shot using overhead cameras to present a bird’s eye view. The haunting score makes audiences anxious, as does the slow pacing through the crumbling streets and dilapidated buildings. No civilians are in sight, except for the dead civilians hanging by the neck from an overpass. Gun shots similar to those of a machine gun echo in the distance while creating a war zone atmosphere. There’s little to no dialogue during this sequence, except for when Gillick turns to Macer and says, “Welcome to Juárez,” in a monotone voice. These first two scenes set the extreme tone as to how the rest of the film unfolds. Their envoy with police escorts is tailed by what appears to be associates of the cartels. The threat of ambush lurks at every turn, especially the scenes in the secret underground tunnel that they discover. To create the feel of night vision goggles, these scenes are filmed in a greenish tint with a grainy quality. The perspectives through the team’s thermal goggles are filmed in black and white. People are portrayed in non-distinct shapes and accompanied by a score of low baritone sounds. Although Macer is an asset to her team, she questions the tactics they employ and the legality of their actions. Over the course of the film, Kate continues to find herself in dangerous situations and must come to grips with her desire to make a difference in the war on drugs all while staying true to her principles. Blunt is excellent in the lead role and continues to build on her success in action films (Edge of Tomorrow, 2014). The audience follows her every move with the low, handheld camera angles making the suspense tangible. Del Toro steals many scenes despite having very few lines in his role as the sicario. He works with the U.S. as a consultant with a shady past and his own moral code when dealing with the Mexican cartels. As the film progresses, we discover what drives his character and why he’s an emotionless man. Gillick and Graver abide by the unwritten code that in order to win in the battle against drug cartels, you cannot play by the rules. Their objective to disrupt the cartel’s world leads to pivotal action sequences. Villeneuve, who continues to receive acclaim from critics, does an impressive job of showcasing the sprawling southwestern vistas with haunting music that will resonate with the audience well after credits roll. Although there are a number of action sequences in the film, none feel cheesy. In fact, they complement the film rather than drive the story. Bottom-Line? Although Sicario is a very dark take on the Mexican drug wars, this action-thriller is worth seeing in theaters and could potentially receive Oscar attention for Denis Villeneuve’s direction and performances by Blunt and Del Toro.